Occasionally we’ll hear that someone has used ratchet straps to secure their Rightline Gear Car Top Carrier, either because they felt the straps we provided weren’t sufficient, or because they felt it was prudent to be extra cautious. Certainly we want you to do what makes you feel safe and secure, but there are a few things to consider before using ratchet straps along with or instead of the carrier’s standard straps. The Rightline Gear carrier straps are specifically designed to work with our carriers in both ease of use and in strength. They have been tested to ensure that they will keep your carrier secured to your vehicle. We cannot make the same claims regarding another manufacturer’s ratchet straps. 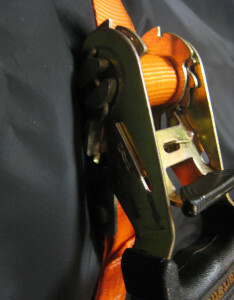 In addition, the metal fastener of a ratchet strap can be abrasive to the car top carrier material. We have definitely seen holes in carriers that were caused by ratchet straps. Using a ratchet strap will void our warranty, leaving you without recourse if your carrier becomes damaged. If you are having trouble keeping the Rightline Gear straps tight over you carrier, chances are the straps are improperly threaded. Please review your carrier set up guide and contact us with any remaining questions. This entry was posted in Car Top Carrier Tips and tagged Car Top Carrier | Ratchet Straps | Strap. Bookmark the permalink. What is the load capacity (# of pounds) for the Rightline Gear Sport 3? The Car Top Carriers don’t have a load capacity as such because the determining factor will be your vehicle’s roof or its luggage rack. The carrier itself will hold far more weight than these two parts of your vehicle will handle. Please check with your dealer for the load information of the vehicle. I would like to purchase extra straps for my rightline gear car top carrier, where can I purchase them?? Hello. 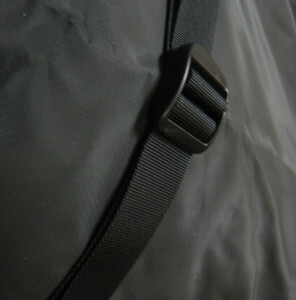 Replacement straps can be purchased directly from us if you can please contact our customer service team at 888.685.GEAR.